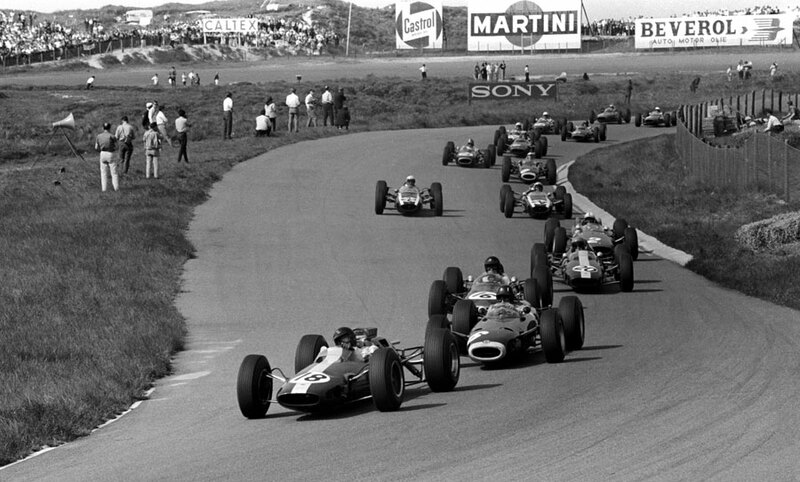 Jim Clark stormed to victory in the Dutch Grand Prix, leading from start to finish and lapping everyone else except for second-placed John Surtees. It was a sunny but windy day at Zandvoort and Dan Gurney, in the ever-improving Brabham, took pole position with Clark and Graham Hill alongside him on the front row. However, it was Clark who got away fastest, just edging ahead of Hill at the first turn, with Gurney hot on their heels. After 10 laps of jockeying for position, Surtees managed to squeeze past Gurney into third, but Gurney wasn't going to let him get away and they battled furiously for the next few laps. A quarter of the way through, Clark was way ahead of the field when Surtees manoeuvred his Ferrari past Hill into second. Gurney had to retire on lap 23 when one of the spokes of his steering wheel broke and Hill was having trouble with vaporisation in his BRM's fuel pump, a problem which was also affecting his team-mate Richie Ginther. Peter Arundell, in the second works Lotus, was catching Hill fast, and on lap 47 he stormed past the stricken BRM into third. Hill made a rapid pit stop four laps later, where the BRM mechanics poured water over the pump to cool it down, dousing Hill in the process. He returned to the race in sixth, but two laps later was back in fourth. Clark won by nearly a minute from Surtees, but the race proved that the new Ferrari V8 engine was reliable and could be a threat to the reigning world champion. Clark and Hill were now joint leaders in the championship on 12 points, ahead of Arundell, Ginther and Surtees.